Nuclear physicist and alien contactee Charles Hall maintains there exists in nature force fields which western science can easily duplicate, that could allow us to travel in space, even faster than light. However, according to Hall we are living in a time that is exactly the opposite to how it was during the life of Galileo. At that time, science was transcending the archaic and boxed-in views of Religious Thinkers and Philosophers. That is, Galileo was thinking “outside the box”. Today, Hall maintains, scientists are the ones who are boxed in, hanging on to the notion that travel faster than light is impossible, since Einstein said it was so. If modern western scientists were to take Charles’ advice and experiment with certain force fields, we might come to a completely different view of what is possible. It would then be practical to travel to- and from planets & galaxies many light years away. Perhaps we are not nearly as isolated a planet as we believe we are! Hall discovered these force fields while serving time in Nevada for the Air Force between 1965 and 1967 as documented in his book series Millennial Hospitality. During that period, Hall was in constant contact with a race he nicknamed the “Tall Whites” who were in an agreement with the U.S. government to operate a base in and around Area 53 in Nevada, also known as “Dreamland”. The purpose of the base was to serve as a way station for their “deep space craft”, which operated utilizing more than one such force field. At that time, he witnessed space craft being designed and repaired, and claims that he witnessed travel beyond the speed of light “regularly and routinely”. Technically, Hall is not a whistleblower because there was no Top Security agreement signed for his military duty in that time period. To the non-scientific lay person, physics can be very intimidating science. However, viewed at a superficial level it can be understood and intuited. For example it is commonly understood how a coil of copper wire can create a force field we call “electromagnetism” when electrons are passed through it. Doorbells are coils of electromagnetism that accelerate a metallic bar to ring a chime. From an intuitive understanding of the creation of electromagnetism, it can be deduced that other force fields are possible if produced from different particles and different coils. According to Charles Hall, there are different sub-atomic particles, such as photons, mesons, quarks, etc., which each produce a different force field when passed through an appropriate coil. The coil most commonly described is one made from fiber optics, so a fiber optic coil provides the passageway which causes the sub-atomic particle to strengthen its corresponding force field in a vortex. To intensify the magnetic force field created by a copper wire, you must use a coil with thousands of turns… AND … if you want to create a really strong force field from sub-atomic particles you want thousands of miles of tiny fiber optic coils! Through his experience, Hall witnessed double-hulled space craft composed of an inner hull and an outer hull where thousands of miles of fiber optic windings were located in between the two hulls. Interestingly, Hall mentions what by now is a fairly well-known meeting, between then-president Dwight Eisenhower and an alien race at a secret military base in California in the mid-1950s. The purpose of the meeting was to discuss an agreement of technology transfer between the military and the alien race. Hall claims that 5 alien craft were displayed on the tarmac and the number 5 is significant. Why? 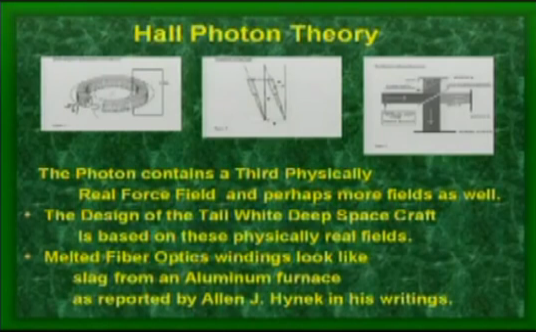 Because Hall believes there are exactly 5 different force fields possible utilizing different sub-atomic particles!